Hooray for Baby Sign Language! This easy to follow book provides gentle guidance for parents wishing to teach their babies to communicate using gestures before their babies are old enough to speak. The baby signs in this book were carefully selected for their ease of use, helpfulness to carers and appropriateness for baby's interests and daily routine. An alphabetical index of baby signs is at the front of the book to make it quick and easy for you to look up a sign. The Baby Signing Dictionary section of the book features over 300 baby signs. All signs featured in the book are American Sign Language (ASL). 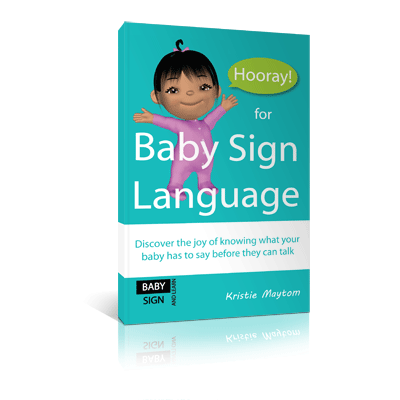 Using the Baby Sign and Learn program, ASL can become a second language for you and your baby should you choose to pursue it in the future. Packed full of insightful and helpful information as told from the perspective of an experienced signing parent. The information covered is appropriate for those who have never heard of baby sign language as well as carers that have used baby sign language before and just need a bit of a refresher. This book makes a great gift to parents or grandparents of infants; newborn - 3 years. The book is lightweight to allow you to keep it handy and the cover is laminated so spills are easily wiped clean. One of the most fundamental human desires is to be understood. Baby sign language can give your baby a way to “talk” to you about their needs, wants, and desires in a way that’s proven to accelerate speech development. Baby signing is a lot of fun! Baby sign language can reduce frustration and tantrums. Studies have shown baby sign may help improve your baby’s social skills. Baby signing can create special bonding moments. Research shows baby sign language can help babies learn to talk. Baby signing has been shown to help stimulate brain development. The Hooray for Baby Sign Language! eBook is now available on the iBookStore.